The BeeAware newsletter is an e-newsletter for beekeepers and growers of pollinator-reliant crops, or anyone else simply interested in beekeeping or the pollination of crops. Each newsletter contains the latest in news, research and development, as well as upcoming events relating to honey bee biosecurity and the pollination of horticultural and agricultural crops. 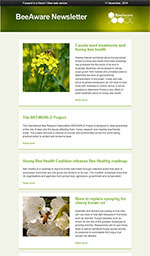 View previous editions to get an idea about the information contained in BeeAware newsletters. If you would like to subscribe to the BeeAware newsletter, please fill in the details below.